FRANKEL (GB) (Bay 2008-Stud 2013). Horse of the Year in Europe in 2011 & 2012. 14 wins-4 at 2-from 7f to 10½f, Ascot Champion S., Gr.1. Brother to SW Noble Mission (Ascot Champion S., Gr.1). Half-brother to SW Bullet Train and SW Joyeuse. Sire of 39 rnrs, 18 wnrs, inc. SW Queen Kindly (York Lowther S., Gr.2), Frankuus, Fair Eva, Mi Suerte, Toulifaut, SP Cunco and of Seven Heavens, Soul Stirring, Eminent, Majoris, Monarchs Glen, Swiss Storm, Senator, Aljezeera, Atty Persse, etc. His oldest progeny are 2YOs. BUENOS DIAS (c. by Peintre Celebre). 3 wins at 2200m, 2400m, €102,180, US$162,751, Grand Prix de Clairefontaine, L, Maisons-Laffitte Handicap d'Ete, 2d Del Mar H., Gr.2, Chantilly Prix Ridgway, L, Compiegne Prix Pelleas, L, Saint-Cloud Prix du Bearn, Prix Avenger, 3d Hollywood Turf Cup, Gr.1, 4th Hollywood Park Jim Murray H., Gr.2, American H., Gr.2. Bonsai. Winner at 2400m in 2016, Chantilly Prix de Rivecourt, 2d Chantilly Prix du Canal des Druides, Prix des Piqueux, Prix de la Croix de Berny, Deauville Prix de Precolette, 3d Deauville Prix d'Auvillars, Prix Asociacion de Criadores de Caballos Puro de Carrera de Uruguay. Blue Ninja (c. by Dansili). Winner at 2 in France. Beaute Divine (f. by Peintre Celebre). Winner at 2400m in France. Badajoz (g. by Elusive City). Placed at 3 in France. Cream of the Crop. Winner at 1550m in 2015-16, SAJC Quayclean P., 2d SAJC Kevin Woods Retirement H.
MIGHT AND POWER (Zabeel). Twice Aust. Horse of the Year. Twice Champion older horse in Australasia. Champion International Older horse (Extended). 15 wins-1 at 2-from 1200m to 3200m, A$5,220,890, MVRC WS Cox P., Gr.1, 2050m-in track record time, STC Mercedes Classic, Gr.1, AJC Queen Elizabeth S., Gr.1, VRC Melbourne Cup, Gr.1, BTC Doomben Cup, Gr.1, VATC Caulfield Cup, Gr.1, Yalumba S., Gr.1, VRC Queen Elizabeth S., Gr.2, NSW Tatt's RC Chelmsford S., Gr.2, GCTC AD Hollindale Cup, Gr.2, AJC Frank Packer P., Gr.3, 2d STC Canterbury Guineas, Gr.1, Ranvet S., Gr.1, VATC St George S., Gr.2, NSW Tatt's RC Tramway H., Gr.3, STC Shannon H., Gr.3, 3d VATC CF Orr S., Gr.1. MATTER OF HONOUR (Casual Lies). 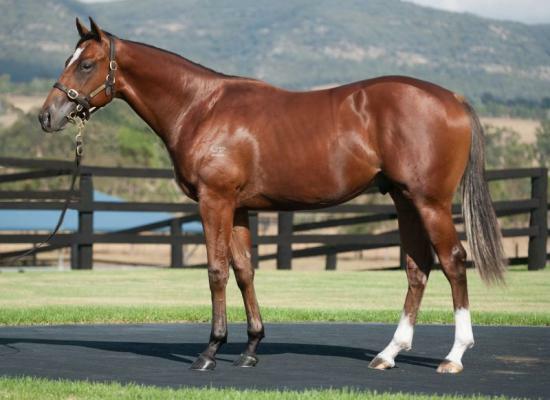 7 wins to 1400m, US$9,820, A$387,585, VRC Yallambee Stud S., Gr.3, Chester Manifold S., L, NSW Tatt's RC San Miguel 8 Million Dollar Day H., AJC Arrowfield H., STC Truscott's Toyota H., VATC Chadstone Fashion Classic, 2d VRC PFD Food Services S., L, QTC Dr John Power H., L, 4th VATC Caulfield Sprint H., Gr.2. BEAUTY PARLOUR (Deep Impact). 4 wins-2 at 2-at 1600m, €554,730, Longchamp Poule d'Essai des Pouliches, Gr.1, Prix de la Grotte, Gr.3, Saint-Cloud Prix Allee d'Amour, Prix Esmeralda, 2d Chantilly Prix de Diane, Gr.1. BAROCCI (Deep Impact). 4 wins from 1600m to 2000m, €60,300, US$208,412, Saint-Cloud Prix Omnium II, L, Hollywood Park Allowance, 2d Longchamp Prix du Prince d'Orange, Gr.3, 3d Hollywood Park American H., Gr.2, Santa Anita City of Hope Mile S., Gr.2, 4th Longchamp Prix de Fontainebleau, Gr.3, Santa Anita Thunder Road S., L.
Buenos Aires (Rainbow Quest). Winner. See above. LUCKY OWNERS (Danehill). Champion Miler in Hong Kong in 2003-04. 8 wins from 1400m to 2000m, HK$23,718,900, Hong Kong Mile, Gr.1, Mercedes-Benz Hong Kong Derby, HK-1, HKJC International Mile Trial H., HK-2, Fukushima H., Fashion H., Lok Fu H., Connaught H., Ho Pui H., 2d Mercedes-Benz Hong Kong Classic Mile, HK-1, HKJC Sha Tin Silver Jubilee Cup, Yan Oi Tong Cup, Kowloon Cricket Club Challenge Cup. Successful sire. TIME FOR WAR (Snitzel). 3 wins at 2, A$470,950, ATC Pago Pago S., Gr.2, BRC Sires' Produce S., Gr.2, ATC CFMEU Mining & Energy 2YO P., 2d Gold Coast Guineas, Gr.3, ATC Brian Crowley S., L, SCTC Glasshouse H., L, 4th ATC Sires' Produce S., Gr.1. MOSHEEN (Fastnet Rock). Joint Top Filly of 2010-11 Australasian 2YO Classifications. 8 wins-1 at 2-from 1000m to 2500m, A$2,780,350, VRC Oaks, Gr.1, ATC Randwick Guineas, Gr.1, Vinery Stud S., Gr.1, VRC Australian Guineas, Gr.1, Edward Manifold S., Gr.2, Blazer S., Gr.2, MRC Manfred S., L, Swettenham Stud 2YO H., 2d ATC Golden Slipper S., Gr.1, MRC Thousand Guineas, Gr.1, VRC Vanity S., Gr.3, 3d MRC Thousand Guineas Prelude, Gr.3, Quezette S., L.